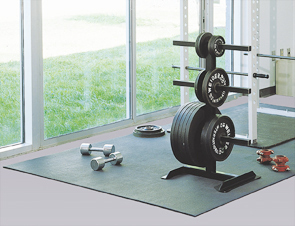 The heavy-duty Weight Room Floor Mats absorb the crush of free weights and withstand the pressure of heavy exercise equipment to protect the floor from scratches and dents. Designed to be extra tough, the heavy-duty rubber matting will not buckle or curl under the extreme weight. The sheer density and weight of the mats holds it in place, and the textured top surface also provides traction for safety and convenience. Textured top surface provides traction and grip. Indestructible rubber mat protects floors from weight lifting equipment. Available in 1/2" or 3/4" thick slabs.